Senate Majority Leader Mitch McConnell (R-KY) last week warned President Donald Trump about the dangers of declaring a national emergency for the proposed border wall, The Washington Post reported. 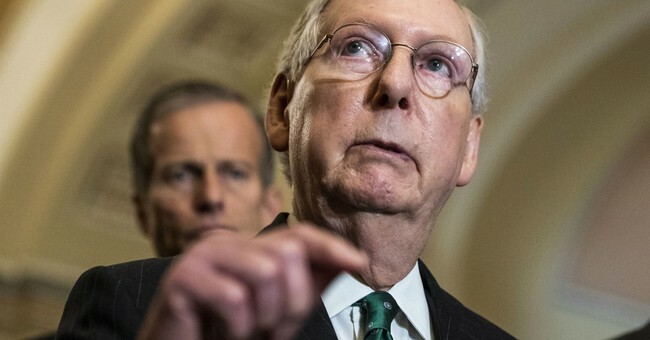 According to those familiar with the private conversation, McConnell said the declaration could divide the Republican Party and Congress would, more than likely, pass a resolution disapproving the emergency declaration. Should that declaration happen, as McConnell suggested, Trump could be forced to veto the declaration, which would put him at odds with his own party. As of Friday, Trump sounded prepared to take the steps necessary to declare a national emergency. The White House did not immediately respond to a request for comment on Trump and McConnell’s meeting. A McConnell spokesman declined to discuss the senator’s private conversations. On the same day he met with the president, McConnell publicly voiced his opposition to a national emergency declaration as he encouraged the 17-member congressional committee to find another way out of the impasse. “I’m for whatever works, which means avoiding a shutdown and avoiding the president feeling he should declare a national emergency,” McConnell said during his weekly news conference in the Capitol. McConnell’s top deputy, Sen. John Thune (R-S.D. ), told GOP senators at a private lunch that same day that if they had issues with the president’s declaring a national emergency, they should raise them with the White House, according to one of the Republicans and another person with knowledge of Thune’s comments, who spoke on the condition of anonymity to describe them. Although the senators have shared their concerns with Trump, they're unsure if he shares the similar sentiments. All eyes are on Trump's Tuesday State of the Union address, when he is expected to make some sort of border wall announcement. “I think you’ll find it very exciting,” the president told reporters about his State of the Union address.